Does this little guy scare you? He does me! This is Deegan James, our 4th and final child. (lol, no, this was decided BEFORE we knew that Deegan would inherit all 3 of the other children's "naughty" traits, and bring quite a few of his own tricks with him! He is so loveable, and huggable, he loves kisses, and hugs and squeezes, and he is sweet and holds mommy's hand, and kisses my cheeks, and smiles with those giant, cutie pie dimples...... AW! He is a doll! But do you remember Eddie Haskell from Leave it to Beaver? Lol! Yup, I see this personality in my other son, Aaron, and Deegan now as well. I can just imagine the "Well hello Mrs (fill in some lucky little girl's mom's name here hehe), You are looking beautiful, and what a pretty dress you're wearing today! ", then, "Hey, (lucky girl's name again), let's go throw all the books off your mom's bookshelf, and rip the door off the hinges!" Well, ok, maybe not to that degree, and i will pretend I do not hear what it is my sons may be saying to a lucky girl someday, but this is what Deegan did last week. Yes, you read that right. This cute little 1 year old, actually ripped the bedroom door off it's hinges! He did a lot of things last week, after he let me see his true colors, I wasn't really given a lot of time to comprehend this, when my house was literally torn in pieces, by my little monster! He is definately one very, busy boy, and i am just to old to keep up with him I guess. Within a matter of minutes, this young man will rip your bookshelves apart! 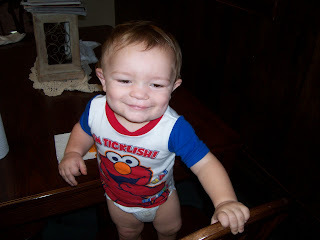 He will dump toy crates, toy boxes, toy bins, all over each room of your house! He can also rip open Lucky Charms boxes, poke holes in the bags, (while you are cleaning up the pasta he "spilled' out of the pasta containers), and he can climb tables and push chairs to counter tops so he can easily grab your overfilled coupon binder and throw them on the floor, making them all fall out of their perfectly placed little pockets, all arranged for a fast and simple errand day!!!! AAAHH!!!! This little guy is just so cute when he's doing it though, but I'm starting to think he is about ready for time outs! Deegan was born with cleft lip and club foot and a few other very small issues. I was told he would have much more wrong with him, and we are now going through some issues with Chiari Malformation and Hydrocephalus, (both are very minor, and not anything to really worry about), So, I have to admit, I have been very easy on him. I believe he knows this to, and I think he thinks he will always get away with a lot more then most. Not anymore! Anyway, the door coming off it's hinges was the last straw with me, I didn't know if I should laugh or cry. I have heard the saying from people as they tell others about what happened that day at their homes with their crazy children, lol, and I have often heard people say, "He ripped the door right off the hinges!" so, I am sure there are plenty that will not believe me, however, I thought of that before I fixed the door, and I do have a picture of the door hinge being unscrewed. Deegan was in the room playing towards the door, and I didn't think much of it, then I saw the door had a pretty good size space between it and the wall. I thought that was a little odd, so I went to check it out. Well, I saw the large screw that was pulled from the hinge, and I decided i will go away for a minute or 2 before i lose my mind. I walked away to clear my head, heard some loud "door noises", and came back to find Deegan wiggling the door and looking at the top at the 2nd screw that was ready to fall out of the hinge! I ran over as best I could, and grabbed him, and just when I did, the door was on the floor! I had to quickly set him down, pick the door up and try to reach it as best I could without a chair or anything, to place the screw back through. Do you have any super nutty stories to share about your own little monsters? I have tons, and I know most of you do too!! Please feel free to comment and leave any links to your posts, blog, facebook, where you have your own horror stories! !